This week on Lazzat Photography Vendor Spotlight we sat down with Pensacola Florist, Fiore. 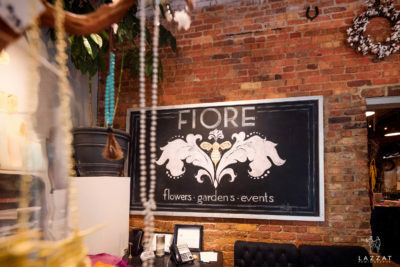 Fiore is one of the most established floral companies in the Pensacola wedding industry! (Lazzat) Hi, this is Lazzat with Lazzat Photography and in our next Vendor Spotlight video interview allow me to introduce you to Mrs. Shannon with Fiore. So tell us a little bit about your business, how did it all start? I have been in the flower business now for 30+ years, I started as a teenager and opened my first business with my friends when I was 19. It’s progressed from there. I have definitely owned my own business, worked for other people and now at this point in my life I have taken all of that knowledge and made it into Fiore. That’s amazing. 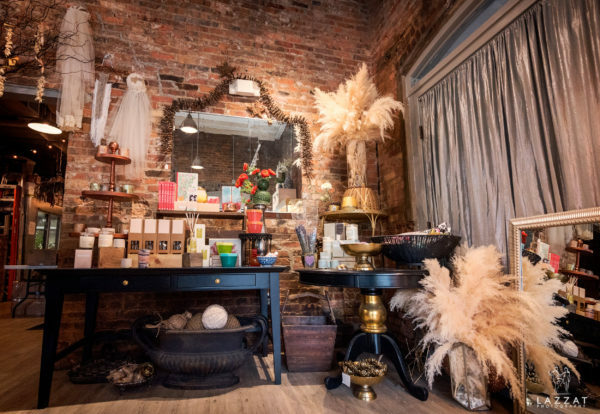 What do you like about working in the wedding industry, how did it turn to be a wedding flower shop? Organically, really. Creating something out of flowers for someone is a very intimate personal process. And so just being a floral designer and starting out I didn’t start out doing weddings, I worked with people who did weddings but really I think the basis of what I do is learning about the design techniques and sitting down in the meeting with someone and learning about them and what design technique is going to work for them and what style is going to work for them. It’s a little bit of what I call getting inside your head and I learn a little bit about you and then I take what I know and I try to make something unique just for your wedding. That’s awesome. So for a Bride who has never planned a wedding before and she knows that she wants wedding flowers, what kind of experience should she expect to receive here, what does it all look like? How many consultations, etc? We don’t really have limits on anything because over the years I’ve learned that flexibility is the best thing to have in the wedding industry because everyone is unique and everyone has their own unique circumstances so we don’t put a lot of limits on that. Some people want to talk to us twice and just say go and then some people want to talk to us a lot more and need a lot more detail and a lot more support so we customize each person. I meet with every Bride and I’m pretty good at reading people and figuring out what they need from us so that way we can give them whatever they might need. Do you offer wedding collections? We do, well it’s custom really because everyone wants to feel really unique so we do certain looks. 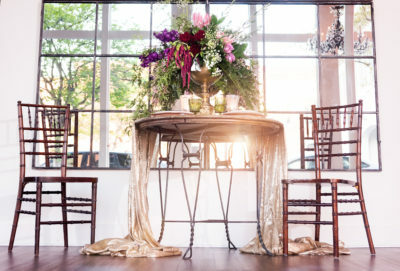 So Pinterest has obviously set the tone, so you can come in and if you love Air Ferns you’re going to have a Pinterest board full of Air Ferns, or if you love Peonies then your Pinterest is going to be full of Peonies so we guide you through availability, through design, through style, through your venue. We take all of these little variables to create something for you so it’s not so much of a set plan, it’s more of a custom design. Do you take on smaller jobs like creating just the bridal bouquet? Absolutely, I had an email this morning for instance that came in, her wedding is this Sunday, I called her immediately and said “let’s not go back and forth on emails, your wedding is this Sunday” and took about 15 minutes on the phone -flower language is another language so I don’t expect people to understand when I say a bunch of different flowers names- but I’m going to show you the pictures and show you the visuals and then I’m going to tell you the names of the flowers that we’re using so if you really want to go back and look you can know what we’re doing but a lot of it is trust and so people trust us that we know our business and let us work. Have you ever had instances when a Bride orders some flowers that aren’t in season? Or can you always substitute? Well, we typically can’t get it if it’s not in season, there are certain things that are now influencing the growers to grow things more year round. I do explain in my meeting with Brides how the farmers work and how our product gets here and all the variable with that so they understand a little bit more that we are working really really hard to get them exactly what they want. But there are color variations and seasonal variations so all those things I think just from experience and really starting out in the flower business, knowing your product and knowing what you’re able to offer. Pinterest doesn’t put seasons so that’s one of the first things I say when they bring in their Pinterest board is that it’s great for inspiration and it’s great for me to get inside your head and see what you like and then I’m going to tell you when we can get that’s going to emulate that same look. You mentioned farmers, I assume you guys get flowers from the farmers, how far are the farmers based? Farmers are worldwide. I’ll be honest, there’s not a lot of farming that goes on locally. There are some such as Sunflowers but we don’t have the climate to grow. We have this subtropical climate with possible hard winters, so you can’t really grow. California is a big farming industry so a lot of our product comes from California but it really just depends on the season. The Tulips are coming out of Indiana or Peonies are coming from up north. It’s just learning your product and where it’s coming from and how you’re going to get it. Absolutely. What are the popular trends in flowers right now, 2018, in the wedding industry? Are there any specific colors that are popular? The classic white and green never goes away. I would say we are a little more of trendsetters so I don’t follow a lot of the trends. I do if people want us to, but for our style personally, we get a little more of modern industrial, we like to mix styles a little bit, juxtapose. I will tell you that the Air Ferns have been a big thing over the past couple years, Succulents have been huge. Those things probably will never go out of style, they have definitely made a comeback. Being in the flower business for as long as I have I’ve seen the rotation of what comes in and what goes out and it all comes back, it just comes back differently. What unique requests for centerpiece arrangements have you received? We do hundreds of weddings a year, so we get lots of unique requests. The most unique one that stands out in your mind, something that’s memorable and you’ve never done before. Ok, well, I will tell you we did a really really beautiful wedding over in New Orleans (so we do travel) and the Bride’s request was a white peacock made of solid flowers, it stood 12 feet tall and it was the focal piece of the room. It took us months. We built it from scratch, every single piece, we built the columns that it stood on. We built it here in the store beforehand to make sure it worked and then we took it apart and we took it to New Orleans. Her tail was massive, it was probably 10 feet wide once said and done. It was a base of artificial but then it was a whole layer of real on top of it and I would say that was a pretty stand out piece for us. I can only imagine, where did she get that idea from? She is very creative, very beautiful and she dreamed it up and we made it happen. It was a collaboration of great minds, I will say that. We are very lucky with our clientele that they come to us because they know that we are a little different and so a lot of our clientele is also in that same mindset so we work well together. They bring all their creative ideas to you to make it happen? They usually have an idea and then we take that idea and we run with it. Thank you, that’s awesome. We tried, we like to collaborate like we are with you! And when people put in the effort and care, so do we. Absolutely. When a Bride is planning her wedding and she needs the flowers, what is one piece of advice that you would give her? Not to get set on one flower. Don’t get your heart set on Peonies unless you want to get married in May or June. That is a harsh reality because really people do turn to Pinterest, and we encourage that, but what I have to just reiterate is that there is no season put on that and the internet doesn’t always have the right answers as far as when things are available because you can kind of put anything out there but really the best advice is to come to a florist that has some knowledge and has the contacts because we are working with growers and farmers around the world and there could be things that could affect the flowers that we can normally get, like a hard winter or a hot summer. So don’t get your heart set on one flower, get your heart set on a look and knowing that we can make that look with other things. I would say that’s my biggest, don’t get married in September and ask for Peonies. Gardenia. I grew up in Southern California and my Grandmother’s yard had a Gardenia plant and a Night Blooming Jasmine and so the days were filled with Gardenia scent and the nights were filled with Night Blooming Jasmine and being in Southern California you were outside in the cool crisp air all the time and that scent brings me back there every single time. Maybe that’s why you became a florist. Well, I lived in Southern California so it was really easy. There were abundant flowers so I just started working there in High School, I worked in a flower shop, I worked in a few of them. And worked my way up for 2 years and I really wanted to learn how to design but I think my age at the time was a factor so I wasn’t really given the opportunity to become a designer. The designers were a lot older and had been there for years so I just went out on my own and just risked it. It just kind of evolved and at one point there was a designer who was well noted and super creative and had a studio downtown and I begged him for years to hire me and he didn’t and finally he did! So I took my little base of clients and merged them with his studio and that’s really where I learned so much about design and so much about being innovative and what the stems can do and what the leaves can do and it’s not just an A, B, C and D of flower arranging. I’ve always tried to create something and then step back and say, “How can I make it better? How can I make it different? What can I do to make this one step beyond?” It’s just taking a step back and looking at something and saying how can it be better? Well, it definitely takes talent and passion to work in the flower design industry. And a strong back! And countless hours. It’s all perishable so we can’t start in advance, we can only start on the same day we start on every day. If we have 9 events, if we have 12 events, if we have 15 events, we still have to start them on the same day so the staff here is incredible! I’ve had the same employees, the rotation that I have is usually the lovely ladies that I hire that are Navy wives, that we know are going to leave us but they’re so great that we just can’t help it. But the rest of us have really built this from the ground up so it’s pretty fantastic. How many staff members do you have right now? On staff, I have 8. We get up to 15-20 in the busy season we bring on extra people. The same people that have been helping us for years are always happy to come back and play with us. Where does the name Fiore come from? So it’s Italian for ‘flower’. My mother in law was generous enough to help me get it started and she is half Italian and my husband is a quarter Italian and it was just a fun name, it meant flower, so that’s where it came from. People ask me all the time if that’s my last name and I’m like nope I’m Irish, I’m Shannon Murphy so we’ve got the Irish and Italian blood in this shop. How much should a Bride anticipate to spend if she needs, let’s say, centerpieces for 10 table, Bridal bouquet, boutonnieres, etc? I would say on average we’re around $2,500 – $3,000. I did the email today and it was $500. So, again, we customize everything but people ask me all the time, “what does a wedding cost?” and I’m like well do you have 1 Bridesmaid or do you have 12, do you have 3-4 sets of parents or do you have 2? All of those things are the variables that constitute the cost of the wedding and whether you’re having 100 people or 500 people so there’s not really a straightforward answer on that it’s really based on the need that you have. 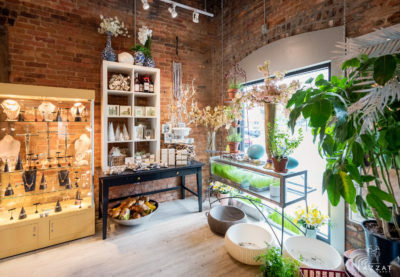 Any fun fact about your store? Oh gosh, we have fun here. We have a lot of fun at work. I will sit in consultations a lot of the days and we have glass doors and these girls are laughing all day long which makes me happy inside because they literally are expressing themselves in flowers. They have full range to make stuff, I’m not over their shoulder all the time like change this or do that. Now I am if I know that it’s specific and maybe I didn’t write that down, you know there’s communications sometimes that I’m not great at because I’m doing 10 things at once and I write down that this is for a special client of ours and I forget to write that she doesn’t like pink, so those kinds of things. But really what’s fun here is that we have fun! We also work really hard. I think everyone in the wedding industry works very hard. So true. I always tell my Brides that being a wedding photographer is so physically strenuous. It’s very hard to work for 10, 12, sometimes 14 hours, non stop photographing. We all have an industry popular term, wedding hangover, we all go through that after the wedding day or a busy weekend. We have a retail shop, so we don’t stop, we just keep going. I tell people too, being in the flower industry, it’s very interesting because we deal with emotions. And whether its a wedding or a funeral or a baby being born or a birthday, most of our phone calls on a daily basis are for a reason. We deal with a lot of emotions and learning how to just make that into a floral arrangement, whatever the situation may be. We’re really kind of reading into someone’s emotions and what they want to say in flowers. 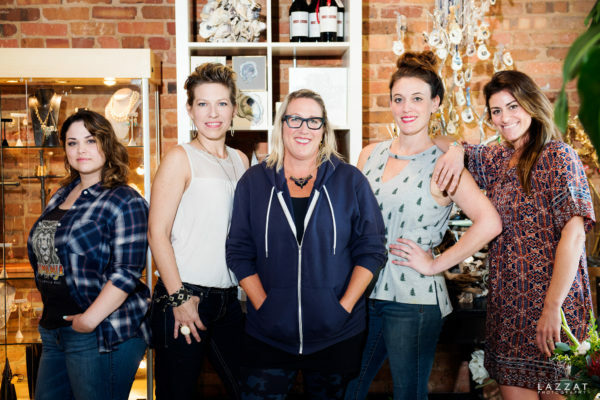 So, Shannon, how does your clientele find you? Well, first of all, we’re located in beautiful Downtown [Pensacola] in a historic building. You can’t miss it, the nice big sign outside that says “Fiore” 15 West Main Street, just west of Palafox. We have a huge parking lot in the back, 27 parking spaces which is a rarity downtown, it’s like gold. And then obviously our phone number: (850) 469-1930 and our website, we have a new website and it’s fabulous, lots of traffic. So that how you find us. Thank You so much, Shannon, for sharing your story about your store and how it all started and I appreciate you taking time from your busy schedule and sharing this time with us. Well, I Thank You. Thank You for caring and for investing and making the effort, and we’re here all the time. We want to give a huge Thank You to Ms. Shannon from Fiore for meeting with us this week and Rising Sun Video Productions for another awesome video! 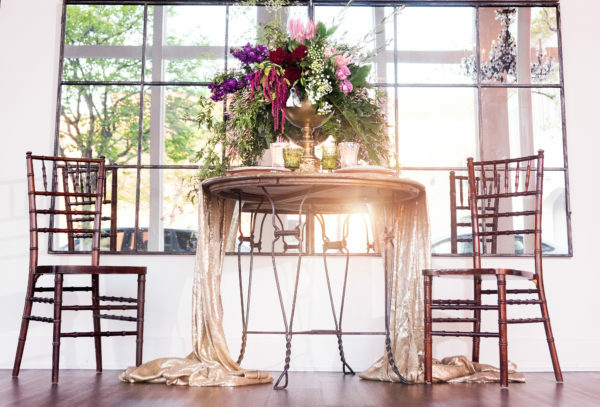 We have also had the pleasure of doing a styled wedding photoshoot at 5Eleven Palafox that features floral decoration by Fiore, check it out here! So it’s Italian for flower. My mother in law was generous enough to help me get it started and she is half Italian and my husband is a quarter Italian and it was just a fun name, it meant flower, so that’s where it came from. People ask me all the time if that’s my last name and I’m like nope I’m Irish, I’m Shannon Murphy so we’ve got the Irish and Italian blood in this shop. Well, first of all, we’re located in beautiful Downtown [Pensacola] in a historic building. 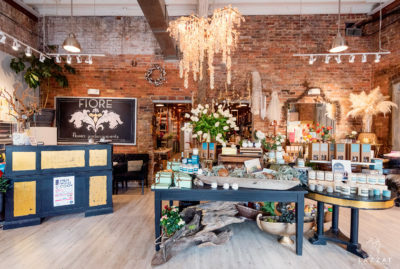 You can’t miss it, nice big sign outside that says “Fiore” 15 West Main Street, just west of Palafox. We have a huge parking lot in the back, 27 parking spaces which is a rarity downtown, it’s like gold. And then obviously our phone number: (850) 469-1930 and our website, we have a new website and it’s fabulous, lots of traffic. So that how you find us.